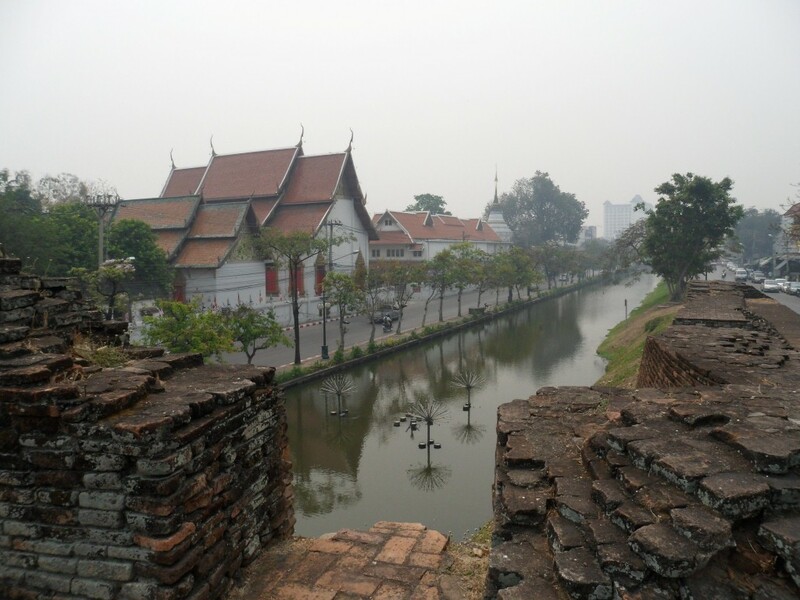 106-111 Chiang Mai to Sukhothai – Do your dream! Our guest house in Chiang Mai was about our 5th or 6th choice, all the others were fully booked. We’re glad we did book though as the city is large and trying to find one off the bus would be a nightmare as most had full signs. As it was, the guesthouse was OK but not great so we only stayed a couple of days before moving. We checked about half dozen and a lot were naff ,but we did find a nice one to move to – but even that was so full we needed to change rooms twice in 4 days! So book ahead if you want a decent place. Everyone seems to rate Chiang Mai so we had high hopes, but looking around the town it doesn’t seem very special at all. The old town is interesting enough, but it isn’t a must visit town. What it does have though, is oodles of trips, treks and excursions into the surrounding countryside – probably the biggest variety of trips we’ve seen. As its towards the end of our trip though we’ve done a lot of similar things already so had to choose wisely. Chiang Mai has a “must see” temple on the top of a nearby hill which we decided not to bother with – too many temples!! There is also a Tiger Kingdom where you can play with tigers, but after a bit of research Mel decided there were too many questions over their welfare as they seem to be bred for human entertainment, then sold on rather than being rescued. It does have one redeeming shop we found, ice cream for 10 bhat (20p) – or eat as much as you can with a 2hr limit for 69 bhat (£1.50!) and that includes as many toppings as you dare. 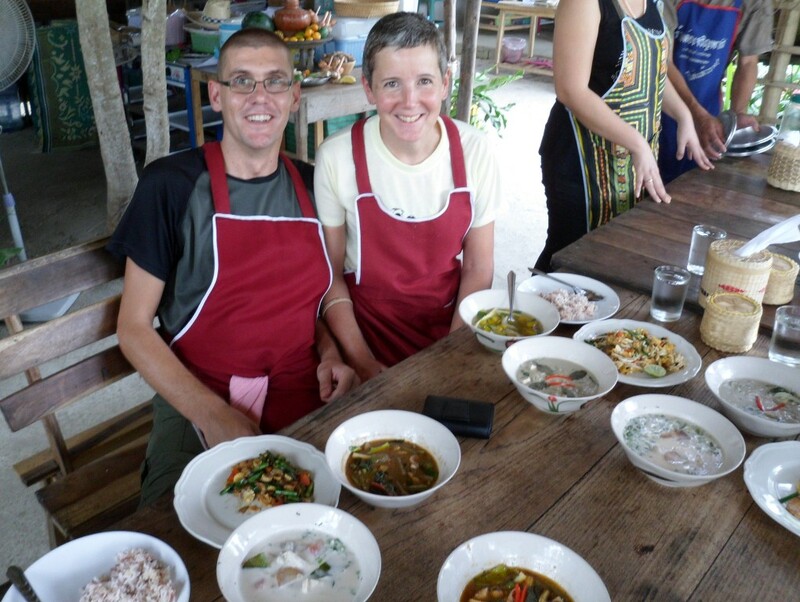 Our first trip from Chiang Mai was a cooking class at an organic farm just outside town. We learned to cook a fair few new dishes, and it was so nice to get most of the ingredients from just outside. Probably not all will be available in the UK though which may make replicating them tough , but overall a very (full) filling day. For an evenings entertainment we went to the international boxing stadium to watch some Thai Boxing. What we didn’t know was there were a couple of the bouts were between kids who were under 10! Bit weird watching them fight, but the ref had them under control. There was also a round with 8 blind-folded boxers which was a good laugh, as they just hit anything they found – including the ref! 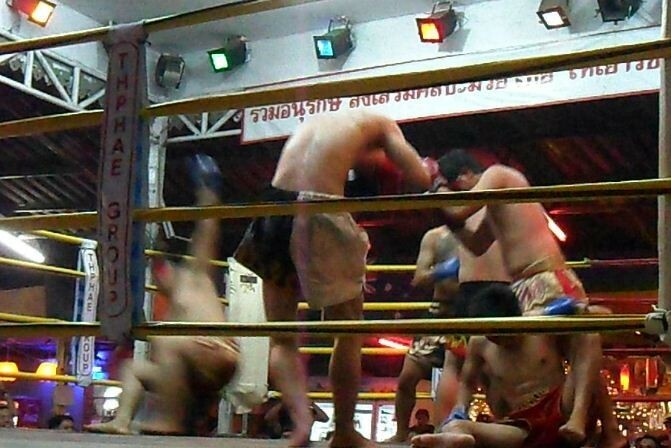 There were a few real bouts though which were very interesting to watch – Thai Boxing is a bit “dancy” and as well as punching aka UK style, and the boxers are allowed to use their feet too. The heavier weight fights were quite impressive and it was clear both parties were trying to win! 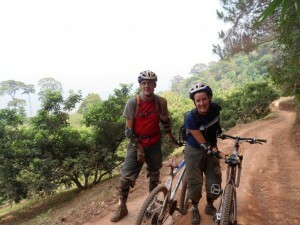 Our next day we decided to have some more outdoor fun, and undertook a “hike and bike” trip – a 3 hour hike up a mountain, and a 2 hour mountain bike down on off-road and some single tracks. 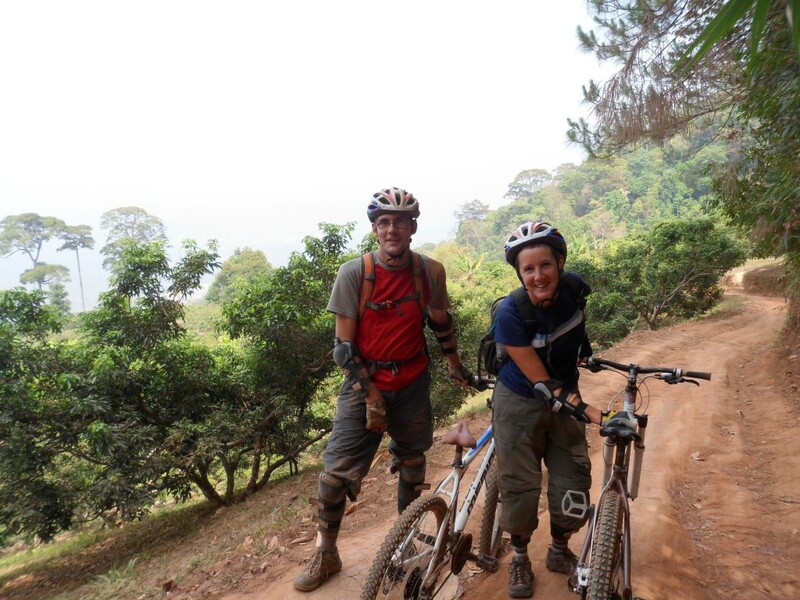 Unlike Chiang Rai, these bikes were a bit knackered, iffy brakes; iffy gears; baldish tyres; and my pedal was broken. All this meant that I was the first to fall off after hitting a pile of sand, and Mel fell off a couple of times – once by running into me. Hmmm. One guys bikes brakes failed completely and he came off – and as they ran out of elbow pads he didn’t have any and hence cut his elbow. Apart from that it was an excellent trip and we survived and enjoyed the views from the mountain. We’re now know how good our bikes are! We got covered in sand and dirt, and whilst it is great in Asia getting your clothes washed for next to nothing, the washers lost Mels new “Specialized” cycling t-shirt. Even more annoying as it was new and perfect, unlike our other t-shirts that are due for the bin anyway. For tea we found a great plastic-chair local eatery and had a lovely meal with one of the best BBQ fish we’ve ever had. Including beer it was still under £2 each. Bargain. Going to miss this sort of thing when we get back to UK. Good news though as the laundry woman found Mels t-shirt and delivered it back to the hotel. We left Chiang Mai early to head to the bus station and sort out transport for our 6 hour bus journey to Sukhothai. We arrived at the wrong terminal but were sent to the correct one. As soon as we entered we got “where do you want to go?” – and then pointed outside. As soon as we got outside we got “where do you want to go?” – and then pointed to a window. Then same question, ticket, then pointed to a bus which promptly left. Thai efficiency at is finest! Arriving in our Sukhothai, our guesthouse was rather good for £8 a night, and even the local market had a cake stall with small cakes from 2p! Thats tea sorted….